Oh, sure, because Joe Flacco behind a better line would totally turn this thing around. Joe's more than doubled his YPA from last week. He's up to around 3.5 yards/attempt today. PROGRESS. They can't run block either atm. Too many injuries. They need depth. Flacco can leave anytime he wants. He's toast. Jags gave the game away, Jets doing everything possible to give it back. Apparently the Texans have an offense now. I'm sold on Watson. He's looked light-years better than any qb Houston has had the last few years. Appears the Panthers are running into the line and settling for a 45+ yard FG to win the game. Because with a kicker who's already missed an XP, this is a solid decision? Edit: It worked, but man, do I hate that decision, every single time. /[KT]ony/ Ealy keeps knocking down Bortles passes. Three minutes left in OT of Jets-Jag and the Jets punt; Allen Hurns manages to not only not catch the punt, but touch it as it rolls past him, and he has to chase it downfield inside the five and return it. Gets it out to about the ten or so, but, of course, there's a penalty, so half the distance back to the goal. That little sequence pretty much describes this game. Marqise Lee, not Hurns. But otherwise accurate. Lee also dropped the 3rd down OT pass that would have put the Jags pretty close to field goal attempt territory. 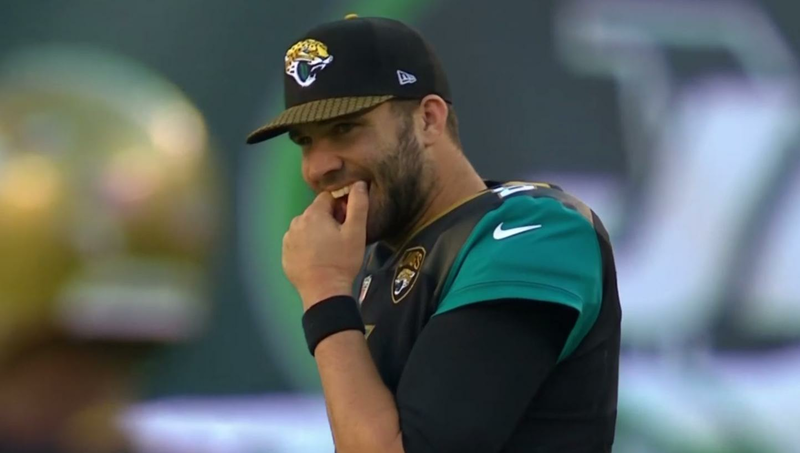 On what was pretty much the only on-target throw Bortles has made on 3rd down this season. O.J. Howard just had his first career TD on a beautifully deigned play, slipping out from a blocking position to be so wide open there probably wasn't a Giant within 15 yards. Maybe 20. And now the game is up to 8 field goals. 12-12. You could be watching Bucs-Giants, where the Bucs have two missed FGs, a missed XP, a failed 4th down conversion, and failed to score a TD from the one yard line. The Giants have a missed FG, failed on a 4th down conversion, and just had a 15-yard punt in the 4th quarter. The Bucs have five plays of 30+ yards, and 16 points. Edit: 22 points, and add a failed two-point conversion to the list. The Bucs should be winning this game by 30. 60 minutes of the Field Goal Bowl weren't enough. 12-12 game goes into extra time. Overtime was shortened to 10 minutes this year; based on the fact Jets-Jaguars and 49ers-Cardinals went to over time this year, can we shorten it to 10 seconds? Nice pace to Fitzgerald from Palmer to win that game, though. Seattle has no offensive line. They have 5 guys out there in uniform with the correct numbers and lined up in the right place but they arent football players. Yeah, their front office is oddly content to waste a half-decade of a good-to-great defense and a decent offense by not bothering to find any linemen worth a damn. At least they won 1 championship, though. Growing up in Seattle I got to watch the Mariners waste the primes of 3 first-ballot HoF players and another guy who should get in before his time is up. Meanwhile, the Sonics ran into the historically great Bulls in their best season (ignoring the Championship in the 70s) and failed to do much else in the playoffs despite having really good teams. Damn, didn't see that Dalvin Cook blew up his knee. Sounding like an ACL tear and out for the season. And Chris Carson is potentially done for the season. Davante Adams' tests came back negative for a neck injury, so at least there's that. Looks like Glennon's starting role is toast. Who would have thunk it? The screaming guy in this vid's probably changing his tune right now. Honestly I don't think Glennon has done much to warrant the Bears not trying somebody else for at least a few games. At this point in the season, with the injuries on the roster it's not like they have much to lose. Still think Glennon could be an adequate low-end starter in the right situation. Chicago is not that situation. At all. Trubisky is going to get his first start on Monday Night Football, which I'm sure the league is thrilled about. Oh, I agree. At this point, Chicago is basically playing for draft position after four games. Might as well throw the kid into the fire. I mean, drafting him the way they did seemed insane, but, now that he's there's, might as well see what you got.